It is well known that the principle of noble simplicity is often interpreted in a needlessly minimalist sort of sense. Noble simplicity, however, should be paired with another great principle: noble beauty. Can minimalism be beautiful? It certainly has the potential to be and it could also be noble, but by the same token something more ornamental can likewise still be fundamentally "simple" and "noble" -- especially in the Roman sense and tradition which should be our fundamental guide here (never mind in the sense that was intended by one of the originators of that concept, the liturgiologist, Edmund Bishop). What struck me about this photo is the noble beauty and simplicity of it all. Some might object of course, having tied themselves to that minimalist interpretation, but noble simplicity didn't historically mean plain and it certainly doesn't have to -- in fact, a recklessly minimalist or plain approach could even endanger nobility if not also beauty itself, just as the opposite approach can likewise run the danger of becoming gaudy. If we analyze the components that can be seen in the photo -- and that is what I wish to limit this consideration to -- we see the simple cylindrical marble columns that form part of the ciborium magnum -- a liturgical-architectural feature that is both prominent and impressive, yet not contrary to simplicity in its fundamental parts. What of the altar itself? Well here we are only just seeing the portion that forms the edge of the mensa of the altar, but what we do see there is also both noble and simple; a simple cream stone with a beautifully carved repeating pattern that let's light and shadow do its work. Once again, noble, beautiful and fundamentally simple. On the altar itself we see six brass candlesticks with properly proportioned candles and the altar cross. These candlesticks and altar cross likewise have an organic design to them and are by no means plain, yet here again, they are ordered, symmetrical, with simple, clean, repeating lines and forms. Even from an angled view such as this, there is no clutter to be found here, just an appealing harmony and symmetry. The most ornate components visible here would be the vestments, a festal chasuble and mitre as well as pontifical dalmatic, tunicle and gloves. Yet even here, where we find the most visible detail and variety, the colours are harmonious and not over-stated. The parts fit to the whole, complementing one another. 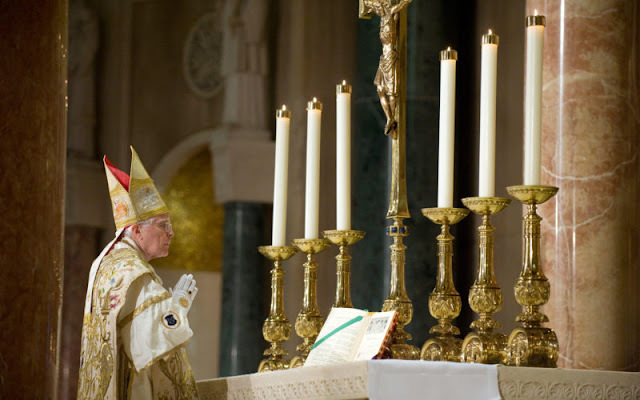 As I look as this photo, I am struck by the simple but awesome beauty of the Roman rite. Obviously we are only looking parts of a greater whole here, but my point in raising this is to suggest that principles like noble simplicity should not be confused or equated with plainness. What's more, the mere fact that something could be "simpler still" neither means that the simpler expression is either a more genuine expression of 'noble simplicity' nor does it necessarily mean that the more ornate version is not.